This year marks the 20th anniversary of the transcendent TV series The Sopranos. As its creator, David Chase, understands better than most, a lousy ending can ruin a lot of the good work you’ve done. Chase famously used a sudden blackout to conclude the Sopranos’ final episode while Journey’s “Don’t Stop Believing” played in the background. How to conclude a great sporting event is equally important. And just as fraught with error. And controversy The NHL, for instance, decided to add five-minute overtime to end ties in 1983. Tired of wishy-washy endings and conscious of avoiding endless overtimes that would annoy broadcasters and their travel partners, the league added a best-of-five shootout in 2005. In the first year of the shootout, 51.6 of OT games ended in a shootout. To resolve more games in the OT, the league instituted a three-on-three format in 2015. That dropped the number of games using a shootout to 37 percent by 2017. Which is fine by a lot of people who think the shootout is an abomination, a skills contest at best. These traditionalists want a return to ties or a longer OT period to resolve things. They point to the NBA which plays as many OT periods as needed to resolve a game. Others think the spectacular goals and the tension of sudden-death are a just reward for fans who’ve invested three hours plus watching the game. They deserve a conclusion. Plus, American TV highlight shows adore shootouts, which blanket the nightly roundups shows. The giveaway over how the NHL itself feels comes in the playoffs-- when games are resolved by a goal in the five-on-five format, no matter how late or absurd the conclusion. For now, however, three-on-three plus a shootout seems engrained in the sport’s regular season. Which won’t stop the bitching. The NFL added OT in 1974 to avoid ties. For much of its existence, OT was sudden death, with the first team scoring in any fashion winning the game. When enough people contended this format was unfair, the NFL tweaked the rules to allow both teams to have a possession in OT— unless the first team scores a touchdown. But the remaining critics point to the system used in the CFL and NCAA. There, teams start from the 25-yard-line and have an untimed chance to match any scores their opponent makes. When one side fails to match the game ends. This can produce three, four, sometimes five OT periods, and some wild box-car scores. Soccer, famously, has no trouble with the shootout even in the final of the World Cup. Skill contest be damned, they’ve accepted the randomness of destiny. Paradoxically, soccer has no trouble with ties in the regular season. Which, considering the paucity of goals in the sport, is probably a matter of survival against games that could go into the next day. Now we see that Grand Slam tennis is re-jigging its rules to avoid the plague of endless overtimes like the infamous 1969 match between Pancho Gonzales and Charlie Passarell that went 22-24, 1-6, 16-14, 6-3, 11-9 in a two-day match. 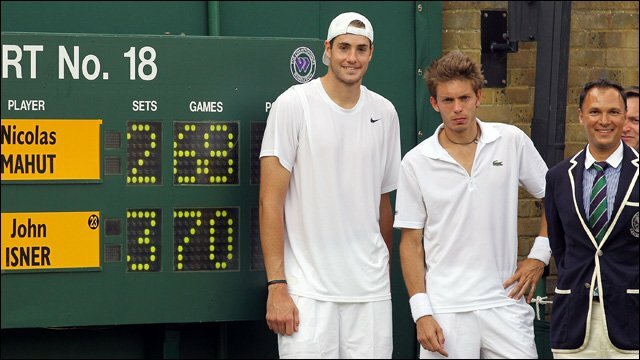 This year, Wimbledon will use a best-of-12 tiebreaker in decisive sets that reach 12-12. This week’s Australian Open will play best-of-18 when the sets reach 6-6. The U.S. Open will stick with the best-of-nine format to decide final sets. Only the French Open persists with the old format, which is probably what you’d expect from the French. But no more. Conceding to the TV networks, the Open now has a two-hole aggregate playoff the same day. The Open Championship has a four-hole aggregate while the PGA Championship goes with three. The Masters, played in the shorter sun days of April goes sudden-death in extra holes. And then there’s baseball, which will play as many innings as it takes to resolve a game, Every summer it seems there’s an endurance match that goes 18 innings. No one foresees that changing in the National Past Time. In fact, if it were up to the Major Leagues, you’d be still be hearing Don’t Stop Believing as Tony and his clan dine forever at the diner.